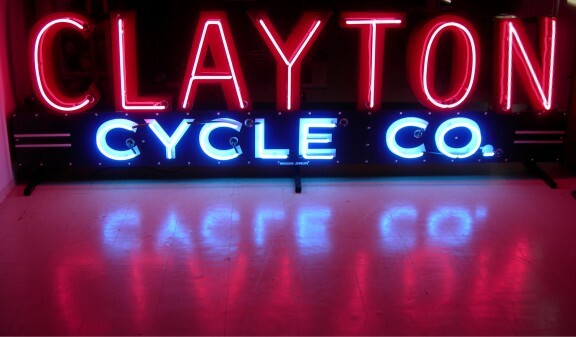 description: A large building sign which hung in front of the Clayton Cycle Co. Before its restoration, overall the sign was in great shape, the porcelain on the lower section needed to be cleaned and polished. Even though the porcelain on the upper letters was in descent shape, the rust on the inside was too much, so the letters were completely stripped down and redone. New neon was made as there were no original pieces. information: The sign has now been completely restored by our restoration team. This is one of the nicest pieces they have done. The pictures don't do it justice, this sign is just beautiful. Click here to see the transformation process from an old weathered sign to a beautiful fully restored piece of history.